The computational model was developed based on a topological optimization of the form and a predictive game of the loads that acts on bench. The initial concept was to play with the thinness of the bench. The decision to optimize resources led us to the search of the best uses and performances of the board, whose dimensions are 2.44 x 1.22 m.
The predictive process of loads estimates the effort to which the bench can be subject and then reverse the load vector to develop a negative image of the bank. 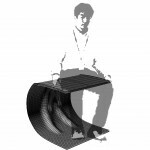 The final result is a bench generated from an inverted curve which is directly related with the estimated load that naturally deforms the bench. Then, the resulting deformation of the negative curvature of the bench will become virtually parallel to the horizontal plane. The workshop main objectives were experimenting structural systems, material optimization and fabricating the designed object. 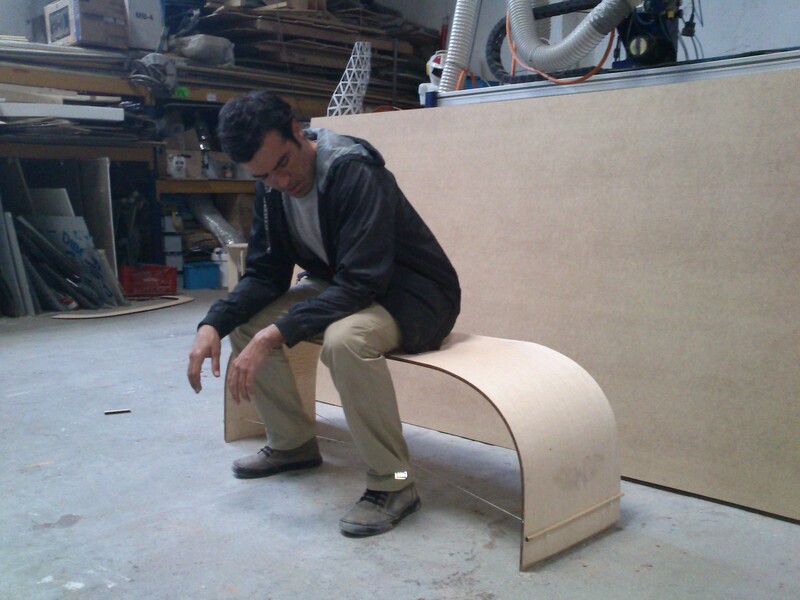 The main idea was creating a two person bench (1.2m x 0.5m) with a simple surface shaped like o-elongated in the horizontal axis using MDF wood with varied thicknesses (3mm and 12mm). The second step was to simulate the loads and fixed supports using millipede plug-in for grasshopper to generate the stress diagrams and areas of tension and compression for the basic geometry. After that a grasshopper script was done to extrude the raster image of the stress diagram to have the external and internal surfaces of the bench. Then the ribbing technique was used in the long direction of the surface to generate the overall mass of the bench. Also a refinement process for the form lines was done to have a box edges to reflect stability in the support points and curvature with some exaggeration in the inner parts to reflect tensions in the load areas. Finally the optimization processes started to modify the final shape of the bench and eliminate some areas of unneeded materials. 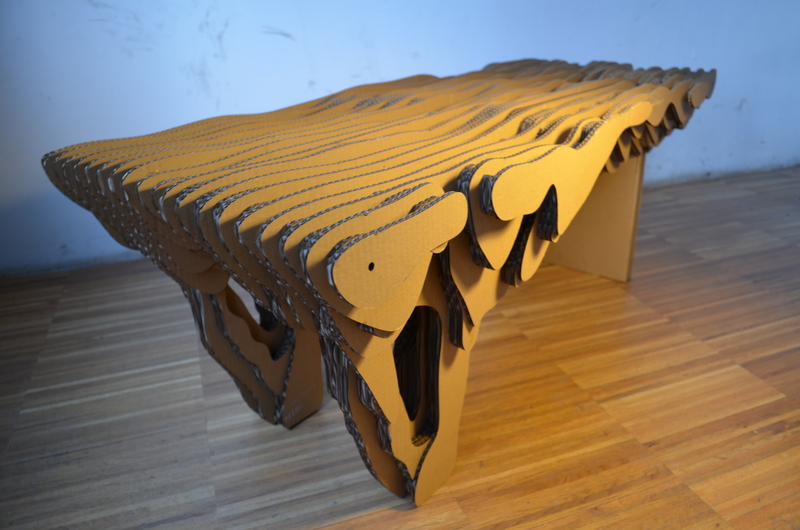 In another word the shape of the bench was a celebration of the structural systems needed to support its function and the final shape was a direct extrude for the stress diagram. 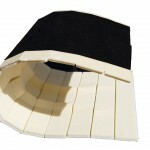 The main idea was to generate an equipment that can be unfolded in order to be transported easily. 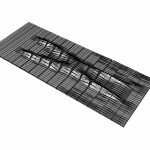 It was designed in Rhinoceros and then applied a Milliped plugin based on Topostruct software in Grasshopper to calculate the material distribution according to a distributed load on top of it. 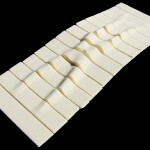 After the calculations were made, we baked the desired geometry and then started the milling process in foam. For this workshop, we designed a two-person bench using the structure optimizing software Topostruct and Millipede, a Grasshopper plugin. We digitally simulated loads and fixed supports onto the general boundaries that we wanted for our design in order to generate a basic stress diagram showing the various areas of tension and compression. The bench has a fixed support on one leg, and a rolling joint on the opposing assymetrical leg. We then optimized the design of the bench according to minimizing the distribution of material based on the structural analysis. We then had the freedom to interpret these final digital results into a physical reality. We wanted to exaggerate the thinness of the final form by layering cardboard cutouts vertically. 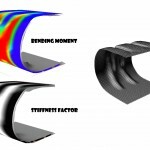 There are outer layers that outline the resultant boundary from the structural diagram, and inner receding layers that help distribute the loads while using as little material as possible. 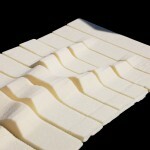 From the top and from the sides, the inner layers read as a separate entity within the actual outer form of the bench.